Check out my review and assembly of the frame. Still got a bit of jello in the video, I need to work on how to mount the GoPro camera on this new frame! But this new build is so bloody fast and locked in! I feel like the RotorGeeks ESCs gives the motors a better punch at full throttle, than the Blue Series ones, despite they are on the same BLHeliSuite settings. My first ever test flight with this frame. Very smooth on a calm day, even though I was just using the cheap Gemfan 6045 props. PID was completely copied from my EVO250 build, and it just works! Maybe still need to tweak pitch axis a bit more. But i am very happy with the result! Still working on optimal values, come back later! And I think I am doing a pretty good job with the wiring lol. the JST Pin is literally same as 2 pin servo female lead can be plugged straight into the motor pins. I cut the other end and solder it on my PDB. Perfect. That’s exactly how I was going to do it. Thanks! Did you run a cmix on this build? Before I email Catalyst for the CAD – thought I’d ask you. I, too am running the PIDs from my EVO250 and thought this may help with a slight tilt to the left front on throttle / punch out that I’m getting. no i am not. IMO there is no need on this frame. Here is my theory. would these components be good with a qav250 frame? would you change anything? 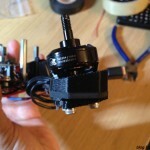 and what fpv gear would you recommend. apart from what you listed above what more would be needed for a clean build? any different antennas for better distance? and lastly here in NZ you can go on 1.2 ghz frequency if you jump a few loopholes like getting a transmitting licence, would it be worth it for a beginner? depends on what you use you quad for, if just for racing, or short distance flying, 5.8Ghz is more than enough for within 600m of range. When I’ve been using it, I will mount the gopro as loose as possible to let the gel absorb as much vibration as possible. Cut two strips under the gopro and one small piece on the back against the frame. Cut the pieces to about .25 inches wide. Thanks for your blog. Its been a big help! thanks Joel, yes I do have some moon gel and I try, thanks for the tip bud!